There was one last photograph to share while we're on the topic of the EISCAT Svalbard Radar (ESR). I had intended to post it at the end of yesterday's web-log entry, but it was such a beautiful photograph that I decided to save it for a Friday. (This Friday-Photo is starting to become a regular feature!) So, although yesterday's post was a bit short, hopefully this will make up for it. 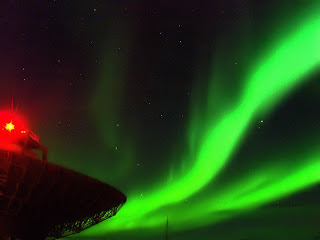 The photograph is of the ESR 42m dish during polar night. The stunning green of the Aurora Borealis (northern lights) is clearly visible. The bright red glow is the aircraft warning light on the top of the dish. And, if you look carefully, you can make out some of the stars in the inky-black Arctic sky. The photograph was taken by Alan Wood from University of Aberystwyth during a radar campaign in January 2006.